First Christian Church - SERMONS - Have You Been Baptized by Jesus? Let me begin by telling you a story about a man who was going skydiving for the first time. He had taken all his lessons and it was time for his first solo jump. So he jumped out of the plane, but he panicked and couldn’t remember how to open his parachute. As he was falling rapidly to the earth, he suddenly met another guy who was going up! So he seized the opportunity and shouted, "Hey, buddy, do you know how to open a parachute?" The guy shouted back, "No! Do you know how to light a propane stove?" I know that’s a “corny” story and a rather bad joke, but it introduces two things: the ignorance of men and the power of fire. God often dispelled men’s ignorance with fire as the symbol of His presence and power. Jesus was speaking about this event in Acts 2:1-4 When the day of Pentecost came, they were all together in one place. Suddenly a sound like the blowing of a violent wind came from heaven and filled the whole house where they were sitting. They saw what seemed to be tongues of fire that separated and came to rest on each of them. All of them were filled with the Holy Spirit and began to speak in other tongues as the Spirit enabled them. Tongues of fire, representing God, the Holy Spirit, rested on each of the disciples. God came to abide in man. This fire was the sign of the New Covenant God made with man through faith in Jesus Christ. John the Baptist prophesized this. John the Baptist is saying that he is baptizing the people with water for repentance. This means that by being baptized by water, they agree to turn from their sins and to start living a righteous life. John also tells the people that one is coming who is greater than he is. He is talking about Jesus. John tells us that Jesus will baptize us with the Holy Spirit and with fire. No one else can do that. Anyone can baptize someone with water, but only Jesus has the power and authority to baptize with the Holy Spirit and with fire. Contrary to what I said last week, here is an example of a second baptism. Their first baptism was for repentance. They had not been baptized in the name of the Father, Son, and Holy Spirit. Therefore, the disciples in Ephesus were believers, but they had not received the Holy Spirit. So they were baptized again in the Name of Jesus, and Paul placed his hands on them. After the Holy Spirit came on them, there was a change in their lives. Sometimes Christians feel like something is missing in their life. Maybe they lack the baptism of Jesus Christ. Jesus said can be remedied by asking our Father in Heaven for this grace. Luke 11:13 “If you then, though you are evil, know how to give good gifts to your children, how much more will your Father in heaven give the Holy Spirit to those who ask him!" There may be other reasons that we are not feeling the presence of God in our lives, but a common reason is sin. If we walk in darkness, there is no fellowship with the Light. Eph 4:29-31 Do not let any unwholesome talk come out of your mouths, but only what is helpful for building others up according to their needs, that it may benefit those who listen. And do not grieve the Holy Spirit of God, with whom you were sealed for the day of redemption. Get rid of all bitterness, rage and anger, brawling and slander, along with every form of malice. When we accept Christ as our Savior and are baptized, we receive the Holy Spirit. However, if we let sin back into our lives a little at a time, we are grieving the Holy Spirit. At some point, we may be completely filled with sin and the Holy Spirit is pushed out of our lives. Is this the reason that you do not feel the Holy Spirit in your life? If so, repent now. Recommit your lives to God. Come back to your first Love. In the Scriptures that we read, we saw that the Ephesians had not received the Holy Spirit until they were baptized in the Name of Jesus and Paul laid hands on them, asking Jesus to baptize them. Jesus did. However, in the second chapter of Revelation, we see that it is possible to lose this grace. Over a period of time, the Ephesians had let sin back into their lives. They had forgotten the love that they had for Jesus at the beginning. Consequently, they were in danger of losing the power of the Holy Spirit and His fire. Therefore, keep sin out of your life! Keep the love of Christ foremost in your heart and you will feel the Holy Spirit working in you. John the Baptist came preaching that the Messiah was coming. Not only would the Messiah baptize with the Holy Spirit, but with Fire. Why should we, as Christians, seek after this baptism? Is it necessary? Mainly, we need the Holy Spirit to belong to Christ and do what God wants us to do. Without Him, we do not belong to Christ and we can do nothing. We also need Him for boldness to speak what God wants us to say. Jesus’s baptism is not a one-time event. From the Scripture we just read, the same disciples that were filled with the Holy Spirit and fire on the Day of Pentecost in Acts 2 were the same disciples that were filled with the Holy Spirit in Acts 4. Why was this necessary? The disciples had just been threatened and warned not to speak about Jesus anymore. They didn’t want to be controlled by fear, so they prayed for boldness and God’s power. Again, they were filled with the Holy Spirit. Likewise, we should seek the Holy Spirit every day for grace to accomplish God’s will and to spread the Gospel. Additionally, the Fire of the Holy Spirit melts our heart of stone and turns it into a heart after God. 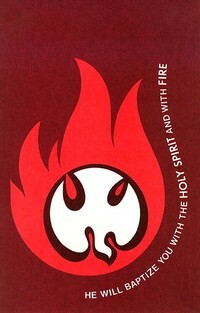 The Fire of the Holy Spirit kindles a love for Jesus Christ that we never knew possible. Just as the fires of passion in a marriage relationship should never grow common or be taken for granted, the Fire of the Holy Spirit should be sought daily to keep our love and passion for Jesus growing. The Fire of the Holy Spirit brings to light the dross (filthiness) of our soul and causes us to repent of the sin in our lives. Little by little, the Fire of the Holy Spirit burns away those things that beset us, in a constant refining process that brings us closer to Christ. The Fire of the Holy Spirit marks the very presence of God in our life. The all-consuming Fire of the Holy Spirit will consume our life and immerse us in service for the Lord of Heaven. We can’t have the Fire of the Holy Spirit and be a pew warmer any more. We have to tell somebody about Jesus. The Prophet Jeremiah said it this way in chapter 20, verse 9, But if I say, "I will not mention him or speak any more in his name," his word is in my heart like a fire, a fire shut up in my bones. I am weary of holding it in; indeed, I cannot. If we are full of the Holy Spirit and Fire, we will have to be ministering to someone, doing something to further the Kingdom of God, and to let people know of the Gospel of salvation through Jesus Christ. We can’t help but do so, because He is in us, and what is in us will come out! However, there are prerequisites to being baptized with the Holy Spirit and Fire. First, we must believe Jesus Christ is Savior and Lord. We must repent of those things that have kept us from experiencing God in our lives. Then we must be obedient to the call of God and be water baptized. Then the Holy Spirit takes residence in our life and begins to clean us up and empower us to go out into the world and witness for Jesus. But that is not all. We must be hungry for the Bread of life and thirsty for the Word of God that fills the void within each of us. Pray and ask your Father to fill you with the Holy Spirit and His fire daily. Then we must surrender our will to Jesus and allow the Holy Spirit to lead us each day. “Our God is a consuming fire.” (Heb. 12:29), and He desires to have, and He will have a church that is “on fire” with His Divine Presence and Power or He will spew it out of His mouth! So, how can we tell if we are experiencing the baptism of Jesus Christ? The following is a brief summary. Examine yourself. 1. A disciple on Fire will care for souls. Do you care or do you ignore the lost? 2. Fire consumes. Is the sinful and unnecessary “stuff” in your life being consumed? 3. Fire purifies. Are you becoming more clean and holy before God? 4. His fire will make us uncomfortable in the world. Are you uncomfortable in the world or uncomfortable with the Word of God? 5. The fire of God will burn away our desire for the things of this world. What do you love the most? 1John 2:15-16 Do not love the world or anything in the world. If anyone loves the world, the love of the Father is not in him. For everything in the world--the cravings of sinful man, the lust of his eyes and the boasting of what he has and does--comes not from the Father but from the world. Peter and John did the same. Acts 8:14-17 When the apostles in Jerusalem heard that Samaria had accepted the word of God, they sent Peter and John to them. When they arrived, they prayed for them that they might receive the Holy Spirit, because the Holy Spirit had not yet come upon any of them; they had simply been baptized into the name of the Lord Jesus. Then Peter and John placed their hands on them, and they received the Holy Spirit. The Holy Spirit, whether it comes by water baptism, the laying on of hands, or by asking the Father, should be important to us as well. We need Jesus to baptize us with the Holy Spirit and Fire more than ever before. The days are getting more evil and if we don’t have the power of the Holy Spirit and Fire within us, we won’t be able to stand in the last days. Let’s repent, seek the Face of God, and ask Him for the baptism of Jesus Christ. Recently, we had a hay ride and camp fire at the Wright’s. We had a good time. Some of us just sat around and watched the fire. I enjoy watching a camp fire burn. It’s fascinating, peaceful, and contemplative. It draws you to it and warms you when darkness brings its coldness. But, if we don’t do anything to keep the fire burning, it will go out. The Holy Spirit is like a camp fire. 2Tim 1:6-7 For this reason I remind you to fan into flame the gift of God, which is in you through the laying on of my hands. For God did not give us a spirit of timidity, but a spirit of power, of love and of self-discipline. God sent the Holy Spirit, and His Spirit is represented by Fire. As a Christian, you have been promised this awesome gift, the infilling of the very Spirit of God—the Fire of God. We need to seek this baptism of Jesus Christ, to live as God wants us to live in this world. When we are ablaze with the Holy Spirit, people living in darkness will be drawn to the fire within us. They will watch with fascination at the life of Jesus Christ burning in us, and He will be lifted up, drawing all men to Himself. So my questions for you this morning are these: Have you been baptized by Jesus? Have you received the Holy Spirit since you believed? If so, what are you doing to feed the Fire? Or as the Scripture puts it: Are you fanning into flame this great gift of God? Christianity is an intimate love relationship with our Creator—the Father, Son, and the Holy Spirit. If the fire of God in your life is flickering, fan it into a flame by repenting and returning to your first love, Jesus Christ. Walk with Him and talk with Him, continually every day.